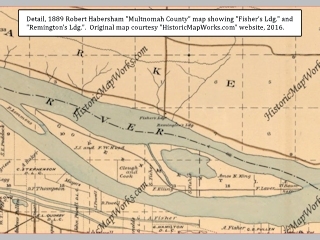 "Simmons, Remington, and Gentry Landings, Vancouver, Washington"
Click image to enlarge 1889 map detail showing Fisher's Landing and Remington's Landing. 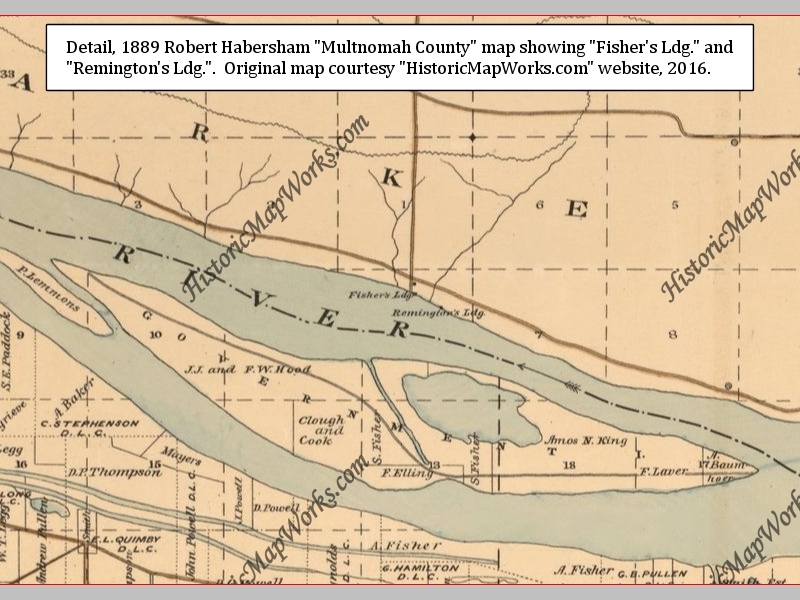 Robert Habersham map of Multnomah County Oregon. Original map courtesy "HistoricMapWorks.com" website, 2016. Simmons Landing was a landing located on the Washington side of the Columbia River at Columbia River Mile (RM) 115.5, immediately east of Fisher's Landing and west of Fisher Creek. Six miles upstream is the mouth of the Washougal River and further upstream are the communities of Camas and Washougal. TWO different "Simmons" have history in this area. Michael Troutman Simmons and William Mortimer Simmons. p.7 ... "All along the Columbia River, the towns cropped up. Each town thrust wooden pilings into the soft river soil and built landings, one after another, up and down the shore: Fisher Landing, Gentry's Landing, Parker's Landing, Steam Boat Landing, Mount Pleasant, Cape Horn, Cascade, Stevenson, and on and on. Steamboats traveled from one to the other, and eventually the North Bank Railroad would link them all the way down to the Pacific Ocean." p.38 ... "Portdock was one of several Washougal docks. River landings connected people with commerce and travel. On the journey upriver, the traveler would pass one landing after another -- Fisher Landing, Remmington Landy, Gentry's Landing, the three Fisher's quarry docks, Parkers Landing, Steamboat Landing, Pendleton Mill Dock, Cape Horn Landing -- on and on up through Cascade Locks and into Stevenson." Note: the landing at the foot of 171st Street, often attributed to Michael T. Simmons, actually belonged to William M. Simmons who arrived with the Solomon Fisher family in 1850 and took up a Donation Land Claim on property east of today's small community of Fisher and Fishers Landing. See more about William M. Simmons below. "Simmons Landing: Michael Simmons came to Clark County in 1844. He is credited with starting the first business in what is now Washougal, where he opened a small shingle mill. He is the father of the first child born to American settlers in Clark County, Christopher Columbus Simmons. The family later relocated to the Puget Sound area. His landing was near the foot of 171st Street." Source: "Columbian.com" website, 2005, Names in Clark County - Clark County: A History. "Another early, if temporary, settler was the noted African American pioneer George Washington Bush, who wintered in the Washougal area with his party in 1844-1845. Included in that party were Michael Simmons (1814-1867) and his wife, Elizabeth (1820-1891). Their son Christopher Columbus Simmons was born in what would later become Washougal on April 14, 1845, becoming the first American child born north of the Columbia River. Bush, the Simmonses, and most of the others moved north later that year to settle in Tumwater near the south end of Puget Sound." "Mike Simmons was born October 8, 1862, in Mason county. He was the son of Michael T. Simmons and Elizabeth Kindred Simmons. His father was born in Kentucky and crossed the plains by ox team in 1844, becoming one of the first settlers in Oregon territory." Source: "Ellensburg Daily Record", February 20, 1939, front page, courtesy "Find A Grave" website, 2016. "In the fall 1844 ... still more American emigrants headed for Willamette Valley rafting down the river past the site where today's Washougal now stands, and among them was a thirty-year-old Kentuckian named Michael Simmons. After passing with his family the site where Washougal now stands, he beached his raft and made camp on land just outside the high walls surrounding McLoughlin's headquarters [Fort Vancouver]. It was a bold and defiant act since all emigrants knew that all land, as decreed by McLoughlin, lying north of the Columbia, was taboo to Americans. When, probably at Dr. McLoughlin's direct order, Simmons was told to move to the south shore, he refused. He advised McLoughlin that his wife was about to have a baby, and insisted, therefore, he must stay. Despite his iron-bound policy requiring Americans to live in Willamette Valley, the King of the Columbia made an exception to it. The Kentuckian and his family might stay until their new child was born. But Simmons, still defiant of anyone British, then struck out into the region north of the fort, his goal being to reach Puget Sound where he had resolved to settle his family. There being no roads whatsoever by which to reach Puget Sound, after ten days of desperate struggle, Simmons was forced to return. When the "White Eagle", as Dr. McLoughlin was also known, then insisted that Simmons cross the Columbia like the rest of his Americans, Simmons again defied him by moving to the site where Washougal now stands, sixteen miles upstream of today's city of Vancouver. Here Simmons spent the winter making shingles from the local cedar trees which he then sold to McLoughlin's Hudson's Bay Company downstream, thereby enabling the Kentuckian to keep his family from starving. Also, however, during that winter Simmons spent much time organizing more Americans to rise up against Dr. McLoughlin and to go with him the following spring on a second attempt to reach Puget Sound. Exulting, thereby, in twisting the British lion's tail they marched north en masse in the spring of 1845 to establish the first American settlement on Puget Sound. Called New Market, it was located at the site near present Olympia, Washington, today known by the name "Tumwater." Thereafter, hundreds of Americans followed Simmons into this new region and by 1850, they had placed the British there in a shadow, outnumbered and largely subdued." Source: Doug Brokenshire, 1993, "Washington State Place Names", Caxton Printers, Ltd., Caldwell, Idaho. "Born in Philadelphia between 1779 and 1790, raised and educated by Quakers, George Washington Bush ... was among the first mountainmen to trap in the Oregon Territory. The Bush family history states that about 1820 or 1821 he made his first trip to the Pacific by horseback with one of the five principal fur companies in St. Louis. Subsequently, he worked as a free-lance trapper, then with the Hudson's Bay Company until 1829. The small community formed by the Simmons-Bush party maintained itself by making and selling cedar shakes (rough wooden shingles). In July 1845, Simmons made an excursion north from Washougal to find a suitable permanent location for a town. On the second expedition, George Washington Bush accompanied Simmons to an area south of Puget Sound that he remembered from his trapping days. By October 1845, the entire Simmons-Bush group had made a claim for lands that later became part of Thurston County, Washington, on a waterfall of the Deschutes River just south of Olympia. Sommons called the settlement New Market, but the name was later changed to Tumwater, which was close to the Native American name of Tumchuck, meaning "throbbing waters." Tumwater was the first permanent American settlement in what became the State of Washington, and its success encouraged others to follow." Source: "George Washington Bush and the Human Spirit of Westward", U.S. National Park Service, retrieved September 2016. In 1850 the family of Solomon Fisher (of Fishers Landing) left Missouri by wagon train to settle in the Pacific Northwest. "It was in 1850 that the six brothers and sisters of the famous family [Solomon Fisher] left Missouri by wagon train. They included Solomon, John, Adam, Job, Ann Jemima and Rachel. Ann Jemima was married to William Mortimer Simmons while Rachel was to marry H.M. Knapp, another well-known pioneer of the east county area. William and Ann Simmons brought five children with them, two of whom died on the trail, and took out a donation land claim east of 164th Avenue. Solomon also took out a claim, lying west of 164th. Adam Fisher's claim lay to the north, taking in what is now Cascade Park. Solomon, who was to become the best-known member of the family, established a riverboat landing at the foot of 164th Avenue. This evolved into a community called Fisher's Landing, which at one time was considered for the county seat. The entire area today is known as Fisher's Landing, although the docks and most of the historic buildings are long gone." "In 1850, William Mortimer Simmons and Ann Jemima Fisher Simmons packed up and headed west with Ann's brothers and her sister Rachel. William and Ann would have 12 children, but they lost two before emigrating and two more of cholera while on the Oregon Trail. The party first headed for the California goldfields, but after meeting disappointed prospectors turning back, they changed course and headed for Oregon." Source: Richenda Fairhurst, 2008, "Fishers Landing", Arcadia Publishing. The U.S. Bureau of Land Management's General Land Office (GLO) Records database show Amy J. [in error, Ann J.] and William M. Simmons being granted title to 639.86 acres of T1N R2E, Sections 1 and 12, and T1N R3E, Sections 6 and 7 on December 22, 1865 (1850 Oregon-Donation Act). The 1863 cadastral survey (tax survey) map for T1N R2E shows the Donation Land Claim (DLC) of Wm. M. Simmons (243.13 acres) being located in the southeast corner of Section 1 and northeast corner of Section 12. The 1856 cadastral survey for T1N R3E shows "W. Simmons" homestead being located at the west border of Section 7. The 1863 cadastral survey shows the "Wm. M. Simmons" DLC (396.7 acres) being located in the western half of Section 7. An 1888 plat map (courtesy "rootsweb.com") shows "W. Simmons" and "T. L. Simmons" [Thomas Lincoln Simmons]. A 1922 plat map (courtesy "rootsweb.com") shows "T. L. Simmons". "John S. Simmons was numbered among the Oregon pioneers of 1850, being at the time brought to Oregon by his parents, a little lad of but five years. His birth occurred in Missouri, August 31, 1845. His father, William Mortimer Simmons, was a native of Virginia, who resided for some time in Missouri and then in 1855, with his wife, Mrs. Ann Simmons, and their family, came to the northwest, settling nine miles from Vancouver on the Columbia river, where he secured his donation claim and devoted his remaining days to the occupation of farming. John S. Simmons was reared as a farm bred boy, ... For many years he carried on farming on his own account, his careful cultivation of his fields bringing him substantial success. In 1893, however, he rented the farm and removed to Portland, where his family has since resided." Source: Charles Henry Carey, 1922, "History of Oregon, vol.3", Pioneer Historical Publishing Company. Alex Remington built his landing on land he rented from Linc Simmons." "Thomas E. Gentry, 97, of Vancouver, WA, passed away at home surrounded by family, on Oct. 14, 2012. He was born on the family homestead east of Fisher's Landing on Feb. 24, 1915, to Everett and Mary Gentry. Thomas was a lifelong resident of the area, residing only 500 feet from his birthplace. Thomas was a WWII Coast Guard veteran, a longstanding member of the Coast Guard Auxiliary and Dolphin Yacht Club. He retired from Crown Zellerbach in Camas, WA and was the owner/operator of Gentry's Landing." Source: "Columbian.com" website, 2012, Thomas E. Gentry obituary.